It was raining fairly heavily as I made my way into Hyde Park for the protest by CasteWatch UK, but I didn’t want to put my umbrella up. It’s days like this that I wish I had an assistant to hold an umbrella over me, as it isn’t really practicable to photograph holding one yourself, though I have sometimes done so. I like to get close to many of my subjects and it just gets in the way, apart from being rather tricky to manage. But at least I have a decent hood on my jacket that keeps me dry without getting too much in the way, though it does make it just a little harder to work, and in particular restricts peripheral vision, making it easier to miss things going on around me. I’ve also experimented a little with waterproof housings for the two cameras (D700, D800E) I like to use, but have yet to find anything I like though Op-Tech make a cheap one that looks interesting. Perhaps readers have some other suggestions? So I work with the front of my waterproof jacket partly open, slipping the cameras partly inside when I’m not taking pictures. Two Nikons with large lenses don’t really fit easily inside, especially if one has a flash attached. Though flash is seldom a good idea in the rain unless you want to take pictures of raindrops. I put a large microfibre cloth over them, or spend my time wiping them down to try and keep them dry. The cameras are fairly well sealed against water, but the lenses – even the pro 16-35mm f4 – not so good. Nishan Sahib flag with its Khanda symbol now adopted the distinct Ravidass Harr Nishaan, and in place of the Guru Granth Sahib they brought out their own Amritbani Guru Ravidass Ji containing the hymns of Guru Ravidass. 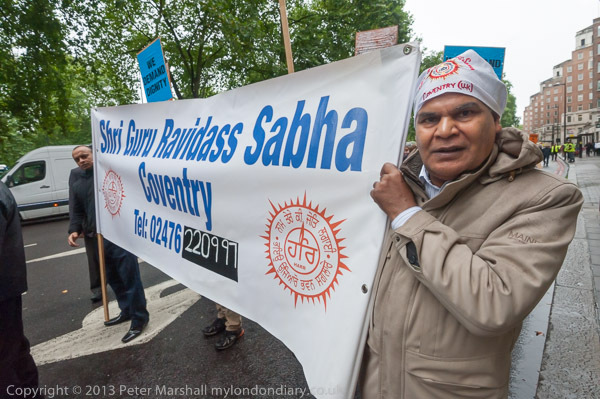 Ravidassia complain they are discriminated against because of their low caste by both Hindus and Sikhs. 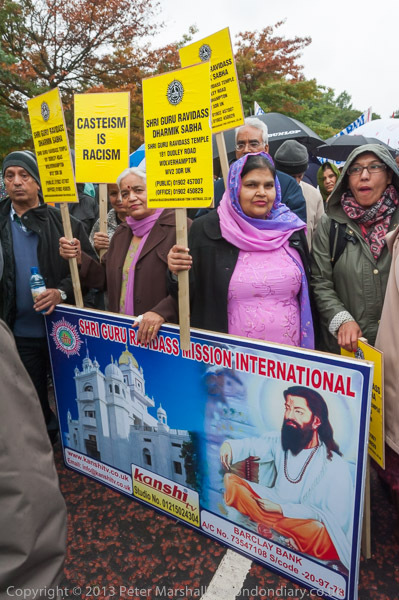 The government didn’t want to act, but were forced to do so by the House of Lords and MPs, and in April legislation was passed to ban caste discrimination in the country under the Equality Act. Rather than accept this, the government, under pressure from Hindu ad Sikh higher caste groups and individuals, decided to delay implementation by setting up a two year period of consultation with these groups, angering both the Dalits and others opposed to discrimination. 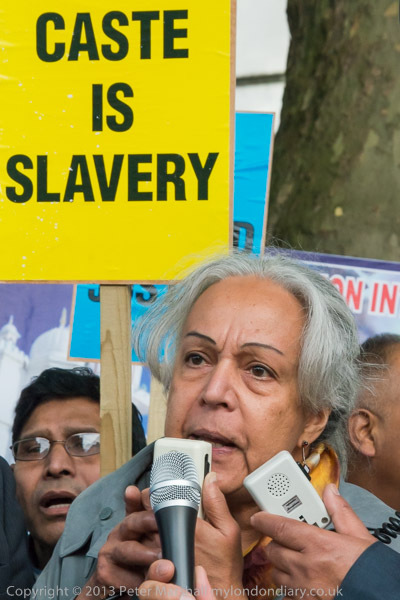 Almost all those on the march were Ravidassia, with just a few Sikhs and others also supporting the demand for speedy implementation of the law. A little under a thousand were standing in the rain when I arrived, many under umbrellas, some listening to speeches and others just standing around waiting for the march to begin, out of earshot of the speakers. Umbrellas can be a problem, particularly for colour photography. While black umbrellas simply cause shadows, sometimes rather deep, coloured umbrellas can give some very strong colour casts from the light coming through them onto the faces beneath. One solution is to use flash, but unless you are also under the umbrella this can give reflections from rain drops in the air. Instead I relied on being able to use Lightroom’s Adjustment Brush to adjust ‘temperature’ and ‘tint’ on faces where necessary. You can see a blue patch I left on the forehead of the woman in the image below. 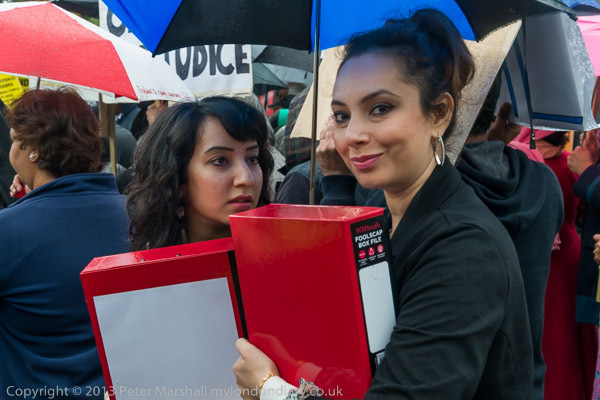 I noticed two young women carrying red boxes, which I guessed contained the petition the march was to present at Downing St, and went over to photograph them and ask about the protest. They took me to photograph the march organiser, and later at the end of the protest I photographed them on their way into Downing St with the petition. 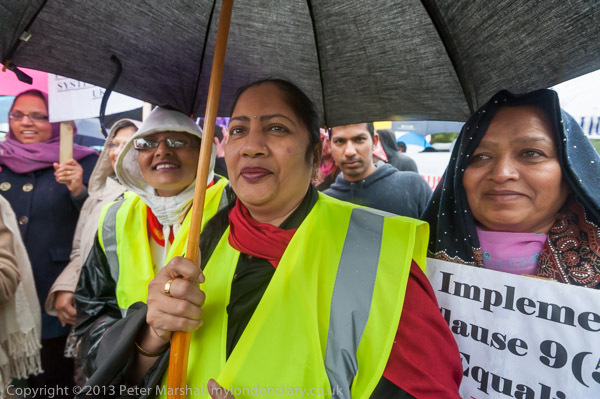 Although it was still raining when the march started, it soon eased off, and I was able to photograph the march as it went down Park Lane to Hyde Park Corner in the dry. Park Lane has many trees along the Hyde Park side, and the lighting varies considerably. Usually I hand around in the lighter areas taking pictures, then after a while hurry on to the next area with decent lighting. At Hyde Park Corner I decided I’d been on my feet for long enough (walking is fine, but photography usually involves too much standing around, which is bad for more legs) and I took the tube for a couple of stops, meeting up with the protesters as they came along Pall Mall towards Whitehall. I’d not made a note of the exact route and had spent a little time waiting at Piccadilly Circus before I realised they were not taking a rout passed there. Opposite Downing St there was a rally on the pavement, with a number of speakers, few of whom I recognised. It’s sometimes a problem in captioning, but if I don’t recognise a speaker or remember having heard the name before it probably is not going to be of great interest to likely clients. Although it was fairly noisy in the crowd and with the speakers using megaphones I was still listening for other things happening, and something made me move out of the crowd to the side of the road. 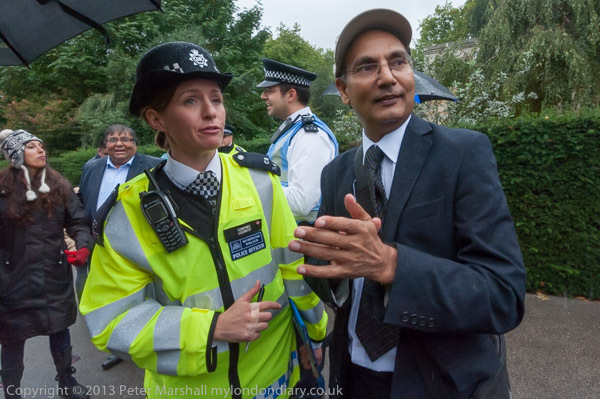 There I found the event organiser and a few others having an argument with a police officer, who was trying to stop them going across the road to present the petition. Finally he realised that they were telling him that they had arranged to do so with the authorities and agreed to let them do so. I was pleased with the pictures I’d taken. It was a cause I could wholeheartedly support, and the people were all very warm and friendly and keen to have their pictures taken. 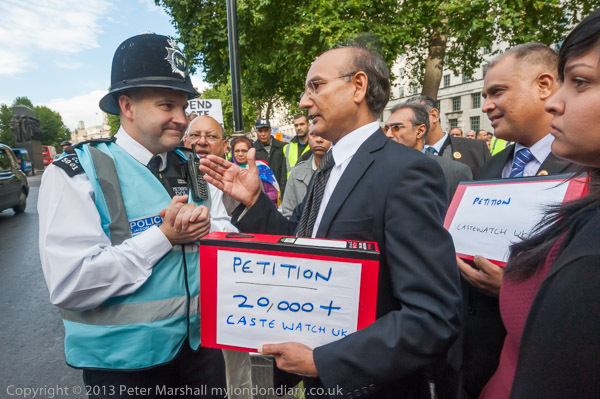 You can see more of them at Make Caste Discrimination Illegal Now. This entry was posted on Saturday, November 23rd, 2013 at 09:00 am and is filed under My Own Work, Photo Issues, Political Issues. You can follow any responses to this entry through the RSS 2.0 feed. You can leave a response, or trackback from your own site.